The Gospel of Luke is an orderly historical account, but it is far from ordinary.In the longest Gospel, Luke places great stress on the unique lordship of Jesus and God's plan to bring salvation into this world. Throughout, Luke stresses that Jesus' message reaches the forgotten people groups of this world, particularly the poor and women, showing us that the gospel is truly intended for all peoples.In Luke Verse by Verse, Grant Osborne leads readers through this systematic account of Jesus' life. He shows us why Luke may be called "the theologian of prayer" and unpacks the far--reaching power of the gospel then and now. With Osborne as guide, readers will learn what this Gospel, which introduces the Suffering Servant who has become the Risen Lord of all and reigns by his Spirit, can teach us today.The Osborne New Testament Commentaries, by respected professor and author Grant R. Osborne, are for people seeking a straightforward explanation of the text in its context, avoiding either oversimplification or technical complexity. Osborne brings out the riches of the New Testament, making each book accessible for pastors and all who consider themselves students of Scripture. 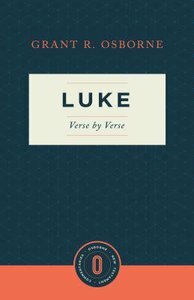 About "Luke Verse By Verse (Osborne New Testament Commentaries Series)"